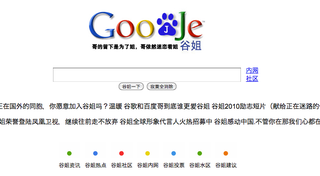 Goojje Search Engine, Launches in China, Claims It's Google's "Sister"
Say hello to Goojje, a Chinese search engine that looks remarkably like one we've seen before. It launched on January 14, and yes, it's filtered for less flavor. The way the name works is this: Jie Jie (Goojje) is mandarin for sister, while "ge ge" (Google) means big brother (er, shouldn't that be the other way round?) The Web Monster (ie, the real one) is being exhorted to stay by its sino-doppelganger, with a message on Goojje that reads, "Sister was very happy when brother gave up the thought of leaving and stayed for sister."